classes school teachers to fill the available vacancies in all over Karnataka Government Primary Elementary Schools. Eligible and necessary educational qualifications having candidates can submit their application form online from 05-12-2018 to 25-12-2018 through the School Education Department of Karnataka official website @www.schooleducation.kar.nic.in. For the first time KARTET Exam 2018 is going to conduct online. 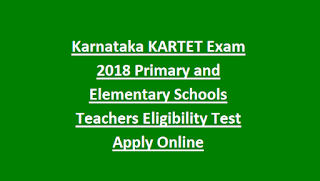 Complete details regarding KARTET Exam 2018 refer the details given below. 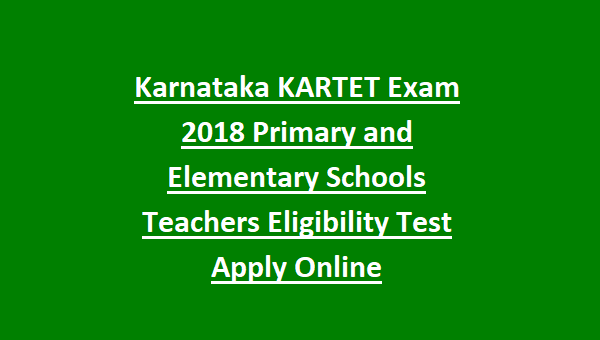 Karnataka Ministry of Primary and Secondary Education department for the first time KARTET Applications are receiving through online mode for the recruitment of Teachers in Primary Schools and Elementary Schools of Karnataka State. So the candidates should upload the scanned images of photograph and signature (in JPG format only) at the time of filling the online application form. Age limits are applicable as per the government norms of Karnataka State. For more information regarding age limits verify the age at the time of online application submission. For Paper II Elementary Stage Classes of 6 to 8- Graduation with Diploma in 2 years Elementary Education or 1 year (B.Ed) Bachelor of Education or BElEd or PUC/Senior Secondary with 4 years BA Ed, B.Sc Ed from a recognized institute. B.A/B.Sc with 2 years diploma in Elementary Education. For both papers exam fee is Rs.1000 for general, 2a, 2b, 3a, 3b candidates and Rs.500 for SC/ST/Cat1 candidates. The candidates have to pay the exam fee through the SBM e chalana on or before 00-00-2018.